The University of Coimbra (UC) is a Portuguese public university in Coimbra, Portugal. Established in 1290, it is one of the oldest universities in continuous operation in the world, the oldest university of Portugal, and one of its largest higher education and research institutions. It is organized into eight different faculties according to a wide range of fields, granting academic bachelor's, master's and doctorate degrees in arts, engineering, humanities, mathematics, natural sciences, social sciences, sports and technologies. It is a founding member of the Coimbra Group, a group of leading European research universities, whose inaugural meeting it hosted. 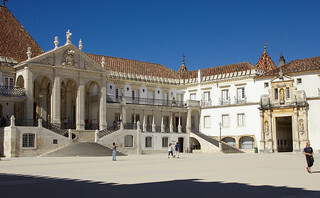 The University of Coimbra has approximately 20,000 students, and hosts one of the largest communities of international students in Portugal, being the most cosmopolitan Portuguese university.